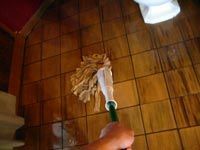 Before you start cleaning tile floors, you'll want to clear your bathroom floor off and sweep thoroughly. The secret to clean tile flooring is the proper mixture of citric acid and hot water. The next obvious step to cleaning a tile floor is to soak the floor with the acid. Now, for trouble spots I usually scrub individual tiles using a rubber glove and a scratch pad. Once you're done scrubbing the tile and you've let the acid work it's magic, it's time to rinse--twice. 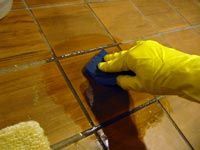 Cleaning a tile floor with citric acid is not only environmentally friendly, it's incredibly effective. I think it smells a little sulfuric. My friend couldn’t figure out what it smelled like, but she knew it smelled weird. Either way, the smell is gone now (after a few hours) and we’re not dead. Our bathroom tile floor has never been cleaner. 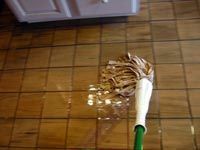 Below I describe the steps I take when cleaning a tile floor, and to the right are some other suggestions for natural cleaning products you can safely use on tile. The secret to clean tile flooring is the proper mixture of citric acid and hot water. I think you should probably get your citric acid online and in bulk if possible. If that isn’t possible, then your local Whole Foods or co-op should have crystallized citric acid on hand for about $1.30/lb. I would recommend the crystallized instead of a fine powder because the powder just makes a mess and the chances of you breathing it in are greater. I used about 1 cup of acid to 1.5 gallons of hot water. The next obvious step to cleaning a tile floor is to soak the floor with the acid. If you’re worried about water damage, you may want to not coat the floor with as much water as I have. 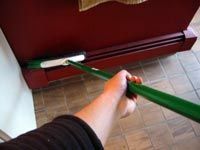 You can wring out your mop a little and spread it on lightly, but the chances of it evaporating before you get around to scrubbing increase when you use less. I soaked the floor to beat hell because we have a large bathroom and I needed time to get to the scrubbing. 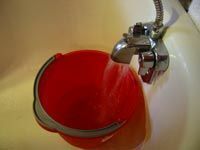 Letting the acid soak a little will also give it time to break up mineral deposits, dirt, and any rust or mold. Now, for trouble spots I usually scrub individual tiles using a rubber glove and a scratch pad. 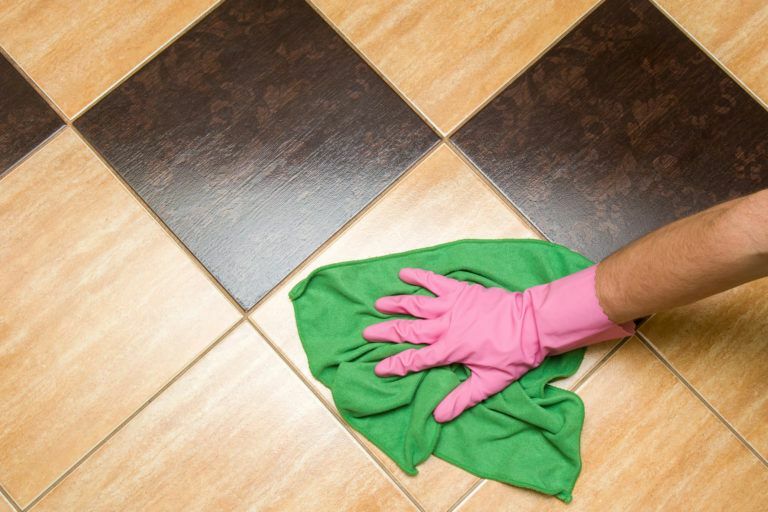 Depending on who has rented before you or how long the tile has gone without cleaning, you may or may not have to do much scrubbing. Luckily for us, the tenants before us didn’t bother cleaning the tile floor properly, so there’s paint, varnish, and a host of other stains all over the floor. It doesn’t take much scrubbing with a strong enough mixture of citric acid, though. Once you’re done scrubbing the tile and you’ve let the acid work it’s magic, it’s time to rinse–twice. Rinsing is the easy part. Usually what I do is dump the acid down the drain, rinse out the mop, fill the bucket up with clean water and then soak up as much of what’s left on the floor with a thoroughly wrung out mop. Then for the second rinse, I don’t wring out the mop so much and just try to pick up the remains by mopping in a figure-8 pattern. You shouldn’t have to worry too much about water spots because the acid chelates most of the minerals in your water. Cleaning a tile floor with citric acid is not only environmentally friendly, it’s incredibly effective. They’re not bad, but they all function on the premise that a higher pH solution will dissolve minerals that tend to build up on tiles, particularly in the bathroom. Of course, there are some companies out there (and some janitors) who don’t observe the laws of natural physics and insist on cleaning your tile floors with a low pH base soap concoction. The problem with these soaps is that they leave more residue than they dissolve. Sure, they make your floor look shiney and new, almost glistening like it does when it’s first mopped–but that stuff is dangerous, and it’ll build up and eventually you’re going to have to put some acid down to get rid of all of that crap. Why not do the job with a natural bathroom cleaner that uses mild acids like vinegar (acetic acid) or lime/lemon/orange extract (citric acid) to get the job done right everytime? I don’t think there’s an easier or more effective way to clean bathroom tile floors than with a bucket of water and some vinegar. Of course, as you can see, citric acid works wonders too. 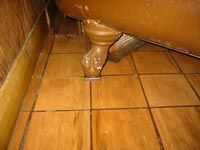 Baking Soda paste can be used to clean tile floors as well. 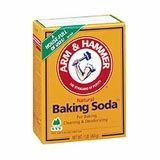 It is suggested that you mix enough water with the baking soda to create a soft paste, then apply it to the trouble spots on your tile, scrub, and rinse with a vinegar/water mixture to neutralize the baking soda to avoid residue. Shiny. 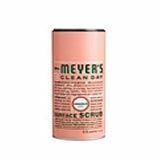 Mrs. Meyer’s Surface Scrub, like other commercial organic cleaning supplies we’ve mentioned on this site, is a great way to clean tile without using harsh chemicals like bleach or other toxic scrubs. It’s good for you and it’s good for the environment. You can order a variety of scents, though we like the Mrs. Meyer’s Lavender scrub sold on Amazon ourselves.